Iberia has launched a special car rental deal with Avis. This will get you 1,700 Avios on rentals up to 30th April, which in most cases is more generous than the ‘3 Avios per £1’ you get when booking Avis cars via BA Executive Club. Full details are on the Iberia / Avis website here. You still receive the free additional driver that BAEC offers when booking via Iberia. You won’t get the 250 additional bonus points for paying with a British Airways American Express card however. If you need a car over Easter or need a smaller Group A or B car or are renting for under 3 days, take a look at the Enterprise / Virgin deal we covered yesterday. One annoying issue with Ambassador is that benefits were not guaranteed on reward stays, except for the 4pm late check-out. To be fair I have never had any problems getting upgraded on reward stays but I know that some hotels in the system stuck to the rules. From 1st March, the $20 food and beverage credit is guaranteed on InterContinental reward nights for Ambassadors. You will continue to get the 4pm guaranteed check-out and mineral water. The only part of the new benefits package that you are not certain to get is a room upgrade. You are better off to the tune of $20 per reward stay, and hopefully most properties will continue to honour the upgrade too. The Ambassador terms and conditions from 1st March are here. Aer Lingus is about to receive the first of 14 single aisle A321LR aircraft. Whilst these look like standard European short haul planes, they have been adapted to have the capacity to fly transatlantic. They are ideal for Aer Lingus which sees them as a way of being able to launch flights to smaller US East Coast cities which could not justify an A330. The first plane has now appeared in the timetable from 1st July. It will operate between Dublin and Hartford, in Connecticut. I would expect to see the aircraft being rostered for some European flights during June to allow pilots and crew to get familiar with it. 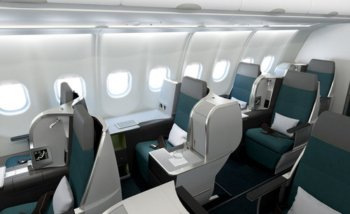 It will have fully flat seats in Business Class as you can see from the image above. If you book a rate such as those available with Emyr Thomas of Bon Vivant which Hfp promotes and this includes an upgrade if available at check in, will you get a two room upgrade? I doubt it probably in effect they are the amb and getting you privileges. We tried that at IC Marseille by booking with Emyr and having Ambassador status. The answer was no, we can only get a one level upgrade according to the hotel as that honoured both promises of a ‘one level upgrade’. Other ICs may be different but it didn’t work in this case. Paris did double upgrade me as a combo of Emyr/ Virtuoso and Ambassador so it is very hit and miss. But IC Paris, when I booked a junior suite once, sent Emyr pictures of 3 suites and asked me to pick the one I wanted upgrading into! You might receive a promotional upgrade offer if you keep checking ‘manage my booking’. Otherwise you can ask about an upgrade offer at the airport. Neither of these are guaranteed. With BA you can only upgrade an avios booking by one class so WT to WTP or WTP to CW but not WT to CW. Another OT. Just received our amex Gold statement and it says they’re removing the following exclusions on its purchase protection cover from March 30th: .i. theft of or damage to items inside a vehicle and, ii, theft of electronic items and equipment. Says everything else stays the same. Refer to amex insurance web page to see the new document. Any travel money offers going on at the moment? Trying to get some currency off before holiday as would be landing at weekend and want to avoid weekend currency fluctuations of Curve. Get Revolut and exchange some money before you go using their midweek rate? You lock in that rate so you know what you’re getting before you go. Another shout for Revolut. You can set FX alerts in the app and exchange as soon as it hits the rate you are after and keep it for the holiday. I learn here that IHG Black Card count Revolut topup as purchase, correct? I can’t speak for IHG but I have an HSBC Premier WE which registers as a purchase afaik. No charge so far but I need to wait for this month’s statement to confirm. Alternatively a topup to Revolut using Curve backed by my HSBC comes through as a purchase. OT can anyone with Hilton status check if the app is currently showing the wrong status level? I stayed 71 nights last year (so definitely diamond) I have 36 nights so far this year (including the rollover nights). The app says I’m silver with 4 nights to gold. The app a few days ago correctly said diamond. Hilton app showing me as gold as expected. Showing me correctly as gold but my stays were re-set to 0 on Jan 1st (status is via Amex Platinum though, so not bothered about that). I don’t know if this is usual or if stays should be counted per membership year and not calendar year as seems to be the case here? Mine is showing as diamond. Diamond as expected. I’d drop them an email or call. I normally use japan, I think the release time is after the us office closes. Japan however is not open on sat night. Last time I used the Iran number on a sat night, which was the first to open, but nothing open at release time. Iran number is actually a london number. They are open Sunday am because Sunday is not a weekend in Iran. Both Japan and Iran numbers knew exactly what they were doing. If you have enough points you can book one way tickets online then call to add it to the 241 voucher without penalty (I think). Never done that before myself. O/T: Has anyone ever been asked to prove eligibility for platinum/centurion Hertz CDP when picking up a car? Do you need to prove CDP, you can take the cars without CDP anyway but its obviously in your interest to have it. You are likely to have to give a credit card swipe for the CDW cap (5 figures sometimes) if relying on Plat. The credit card hold is OK. But I’m worried I’ll be asked to produce a centurion card..
I’ve never been asked, although I do have my Plat card on my profile I doubt they’d ask for it if it wasn’t. If you have booked using the Platinum discount code then, yes, you may be asked to produce it – and if you can’t they can charge you whatever they want. There is no requirement for you to prove you have insurance if you refuse theirs as long as your credit card is good for a big deposit. It’s rare for them to ask for it, I have never been and used it prob 10 times. Although do remember you don’t actually need to pay with your plat card. Same if you buy CDP elsewhere you don’t need to prove it as you leaving the large deposit amount. I think you are confusing CDP with excess waiver. CDP is a discount code, and eligibility for plat/cent CDP requires holding plat/cent amex. The larger credit card hold is a side effect of the CDP because it increases the CDW cap. Brief note re Hartford Connecticut. Not sure the the official name of the airport has changed, but all those years ago when I used a few times it was known as Hartford-Springfield (Springfield MA). The airport is well placed for eastern Mass – Berkshire hills etc and southern Vermont is only an hour away too. I fancy a trip back to New England sometime fairly soon, and this route is very attractive – I just wish that it had been operating back in the 1970s! Are you inviting everyone or asking for donations? Regarding recent 5k Hilton points for ‘Visa platinum APAC bonus’ – the points and any trace of them have vanished, as if it never happened! OT – I did my first MR transfer to Virgin last night but the points haven’t arrived yet. I thought it was meant to be instant? Or does the first one normally take a bit longer? I had pre-linked the accounts a couple of days ago. Should have been instant if the accounts were showing as ‘verified’ after the linkage. If the link was not confirmed it might still be slow-ish. They were so seems a bit odd. And now Flying Club is down so can’t log in to check again. Flying Club been extremely unreliable for a couple of days now. The app too. Flew this route last year in Y, the 757s operating it ATM are pretty decrepit. I’m sure the A321 will be a massive improvement.